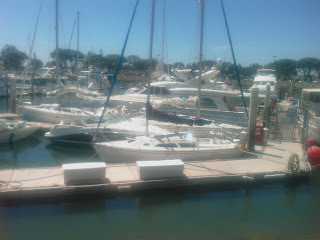 I had a fantastic bareboat charter experience in San Diego. I was speaking at an industry conference at the Hyatt, and decided to call a few charter companies about the cost of chartering a sailboat for a few hours one evening while attending the conference. San Diego Bareboat Charter Companies To my surprise, I found that I could do a 5 day bareboat charter for less than the cost of the hotel over the same period. I talked to several of the charter companies, and finally settled on Seaforth. Seaforth does a lot of hourly rentals for all kinds of watercraft, but they also have bigger sailboats, up to 42' in length (Catalina, Jeanneau, Bavaria, and Hunter) If you are going to charter with them, be sure to check their "overnight rates" for multi day charter rates. San Diego Harbor Marinas The location couldn't have been better. I chartered from the Seaforth location in the Marriott Hotel Marina downtown, which gave me direct access to the Marriott's pool, showers, and hot tubs. The location is also adjacent to Seaport Village and the Gas Lamp District, so there were hundreds of restaurants and places to walk each evening. As long as I'm travel-logging this location, I should point out that it's also just a short $12 cab ride from the airport. You can literally leave the airport and be raising sail within half an hour. I snapped this picture from the plane as it landed to show how close the airport is to the harbor. Even in the harbor, late on a Saturday afternoon with lots of boat traffic, the water was really clear. Look at the picture on the left and note how much you can see in the water. (These pictures were taken with my cell phone, so the detail is not very good.) The water was even clearer in the mornings. Traveling alone and needing to keep the cost less than the hotel's cost, I opted for a Catalina 270. Although I'd like to go back with my wife some time and charter the Catalina 350, a beautiful boat that would make a great mini vacation. The boat I stayed in (Levanto) is in the foreground of this picture. It was so close to the Hyatt and Marriott hotels that it was easy to run down to the boat between conference sessions if I ever needed to. The boat's interior layout was ample for one person (or two) staying overnight for a few days. 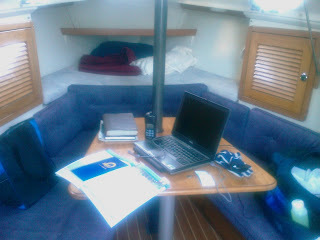 The aft cabin had a fairly low ceiling (being only a 27 footer), but I slept well and had plenty of room. I like the open layout in the newer Catalinas. Sailing out of Seaforth's downtown location was like a dream. It only took a minute to get out of the marina and into the harbor. The winds picked up faithfully around 11am every day, and blew steadily into the evening. Most of the time they were running about 10-15 knots, although one afternoon they pushed into the upper teens for a while and I was almost able to put a rail under. Being unfamiliar with the harbor and the boat, I didn't dare take her out alone. So I recruited crew from the conference to come sail. 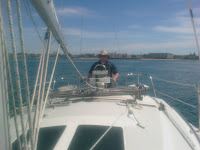 My boss was along on the trip and we managed to get out and do some sailing between conference events. 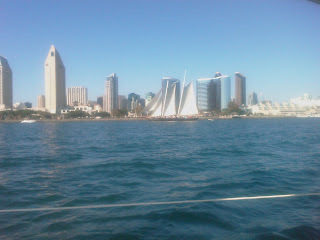 We sailed up and down San Diego Harbor several times. One day the tall ship America was out sailing, so we raced her (and lost, but I suspect she was running her engines...) There were lots of boats on the water, and most of the skippers observed rights of way (even the powerboaters). But occasionally there were a few who didn't know what they were doing. Fortunately they were fairly easy to spot - fenders hanging over the sides, heavy algae growth along the waterline, and creatively untrimmed sails. (The only time things got tight was once when a large container ship sailed past, leaving me, a 50' Tayana, and a 22 footer all tacking in close quarters alongside the ship channel till she passed.) 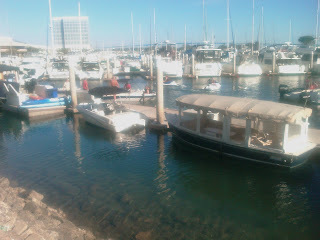 Other than that, there was plenty of room to relax and enjoy sailing up and down the harbor. There's something that ties you to your ancestral roots about sailing past the USS Midway aircraft carrier and then up around the Star of India (the oldest active tall ship in the world), the HMS Surprise (from the movie Master and Commander), and a retired Russion Nuclear Submarine. Then, after sailing around these great ships, I docked back at the marina and walked along the harbor up to tour them in person. That was a fantastic charter. And I definitely recommend Seaforth charters and rentals. 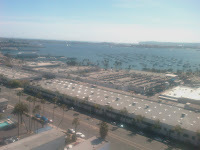 They're great to work with, very accomodating, and their location make an unforgettable San Diego vacation experience. Those 5 days went too quickly! Incidentally, Seaforth also offers sailing instruction. I met a couple from Florida there who came early for a conference and were taking an ASA Bareboat course. They said they really liked the instructor and had learned a lot.